Take charge of your social-media intake so it doesn’t overwhelm your life. I’m a writer and a freelance editor, so my job is to be on the computer. I not only have to write and edit, but I have to link up posts on social media. The online to-do list is never done. There’s always another image to create, post to pin, or quote to tweet. If I don’t set limits for myself, social media and emails could take over my day. 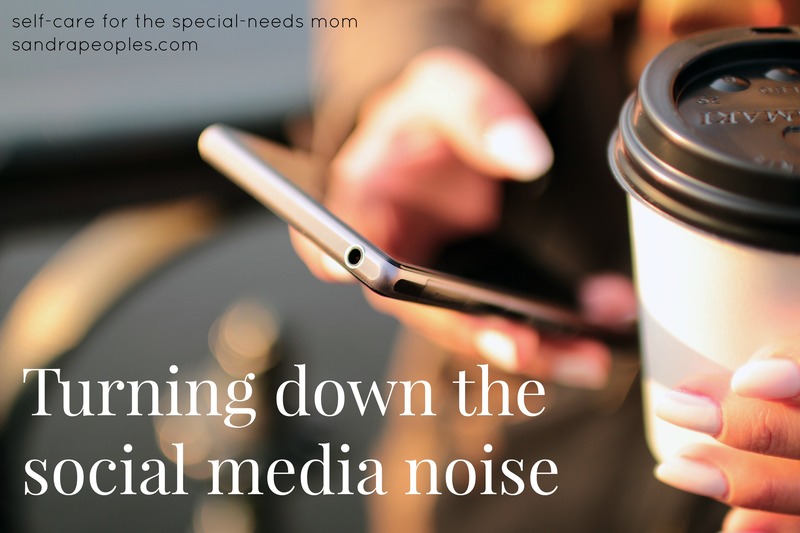 I have a few guidelines I go by to help turn town the social media noise. I give myself a little time to get the most important things done first and then get off. That means I check my phone for about five minutes before I get out of bed to see if my writer posted on Not Alone, link up the post, and check the Not Alone Facebook page for anything that may need immediate attention (like a comment). That way I know what my most important task will be when I get on my computer after James goes to school. I don’t check email unless I have time to respond to the emails. I am really bad about not answering email. The main reason is I read them on my phone but don’t like to reply on my phone. But when I check them on my computer, I forget they are there. To help, I stop checking email on my phone. I use unroll.me for all my email subscriptions. I get 20+ emails a day with sale offers, notices about sales, or other notifications. With unroll.me, they all come in one email once a day and I just click on any I need to read. I turn off all notifications, both those on my phone and ones that go through email. I don’t want my day interrupted by something happening on Facebook. And I don’t want to see a new notification on Facebook and see it again in my inbox. So they are all turned off. I leave my phone at home if I’m with my husband and kids somewhere. This is a new habit for me. I decided if anyone really needed me, they would call Lee’s phone if I didn’t answer mine. So I just leave it at home. Especially when we’re with our church family. I batch tasks. I take 30 minutes to pin to Pinterest. I schedule a month’s worth of older posts on Facebook. I use Buffer for tweets. I get it done as quickly as possible at one time instead of taking time to do it multiple times a day. I use Feedly for my blog reading. I don’t like blog posts in my inbox, so I use Feedly as my blog reader. It’s also easy to share directly to Twitter from my Feedly app. I know not all of these would work for everyone, but if you’re concerned about how much time you spend looking at your smart phone, maybe implementing an idea or two will help!